1989. Will the wonders birthed in that magical year never cease to issue forth? Here, the classic AIP team of David A. Prior, William Zipp and David Winters bring us Rapid Fire, not to be confused with Rapid Fire (1992). This Rapid Fire stars not Brandon Lee, but one Ron Waldron as Mike Thompson. Somehow, we can see the excitement on your faces. Waldron tries for Clint Eastwood in his speech and mannerisms, but comes off as a confused cross between David Heavener and Robert Hays (both no strangers to AIP, interestingly. Prior must have a type he’s looking for). He almost gets into a barfight in perhaps the same bar as seen in Hell on the Battleground (1989). Thompson has a truck named Rollin’ Thunder, and, as if that wasn’t enough, his license plate is “FLEX”. His vehicle contains a lot of text. But even with all that firepower, he can’t compare to Pappy. Unquestionably, Douglas Harter as Pappy steals the movie. It obviously belongs to him. A longtime AIP mainstay, here he finally gets some time in the sun, and he clearly relishes it. Luckily, so does the audience. Pappy is a large, robust man who is bald but has a long beard. He’s usually wearing sunglasses and smokes cigars. His favorite activity is hanging out in his pool, drinking cans of Miller Lite while surrounded by bikini-clad babes. He has great taste in casualwear, and he doesn’t take life too seriously. Yet, he always gets the job done and you can depend on him. We really grew to love Pappy. There needs to be more people like him not just in movies, but in real life. Countering the ebullience of Pappy, there is a sad undercurrent to Rapid Fire, as it was fan favorite Joe Spinell’s last movie. There are credits honoring his memory both before and after the film. Unlike Operation Warzone (1988), he does stand up here, so it’s not solely a sit-down role, thankfully. Spinell was a great talent and will surely be missed. He brought uniqueness, life, and interest to every role he played. It truly is a shame he left us before his time. But back to the silliness at hand, the main baddie, Williams, resembles noted pervert and scumbag Anthony Weiner. At least towards the beginning of the movie. Somehow, after repeated flashbacks and paranoid dream sequences, he goes more towards the Heavener side of things, confusingly, just like our hero Mike Thompson. I guess the Heavener look was big back in ‘89. As usual with AIP, it seems a lot of time and care went into the music. The great Steve McClintock handles it once again, and he delivers some radio-ready songs that were as good as any of the hits of the day. His “C’Mon (My Hometown)” out John Cougar Mellencamps John Cougar Mellencamp, and Bob Harvey’s “The Shack”, well...it out Bob Segers Bob Seger. The songs enrich the movie and ignore the low budget. Sure, there’s a lot of shooting, car stunts, Prerequisite Torture of the hero and whatnot, and even the heartbreaking passing of Joe Spinell, but we can always go back to “My Hometown”. That seems to be the message, and it seems to fit. Featuring a very bizarre, totally out-of-left-field denouement, Rapid Fire is more AIP madness you have to love and enjoy. The law of averages states that eventually your quality would diminish, but fortunately you guys are far and away above average. I don't know what you do for a living, but it's a shame you can't do this full-time, because you have an incredible gift for storytelling. Kudos on yet another stellar review! It was hit and miss, the character Pappy saved it and ruled his scenes. the film score was genuinely good. Pappy bluffing goons was fun and the, erm, ending!! Pure AIP madness! Joe: Thanks for your incredibly kind words. We make zero money for doing this site. It's all for the love of the genre. If fans of the site like you keep reading, we keep posting! To paraphrase Jay Leno, "Read all you want, we'll write more. (Let's not forget Leno brutally slaughtered Randall "Tex" Cobb in the masterpiece Collision Course). Anonymous: Can't agree more. The movie is all about Pappy. Gotta love Pappy! 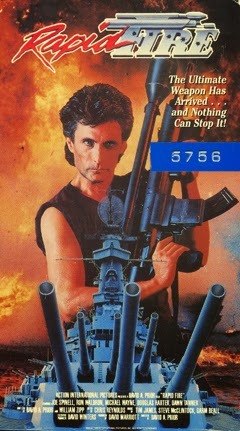 That's got to be the most wimpy action hero on the poster? Haha, He may look wimpy on the cover, but in the movie, he's pretty cool. I watched it on the weekend and couldn't agree more. An average movie saved by Pappy. Agreed. Without Pappy, this would've been a dud.